Once again, I find what you write compelling and especially appreciate the detailed historic context. I am passionately interested in thinking strategically about how NVC consciousness and skills (free from any language or approaches that some may be negatively triggered by)can deepen the possibility of greater inclusion of people who hold (apparently) widely divergent perspectives and related strategies (including systems themselves). Who knows the potential powerful synergy of deep moral commitment to vibrant non-violence, collaborative processes including NVC and highly strategic thinking and action plans to the urgent and incredibly complex challenges facing the world today? Well worth trying!! The ego-mind is tricky. Egocentricity can get one thinking that what is good or best for one is good or best for all and perhaps for all time. This, of course is not so, for what benefits, or aids the progress of, one individual could well be a step backward for another. Seeing the world in this light of complexity and constant flow and growth can help prevent unnecessary conflict. A good example is trying to decide one system for educating all the people. To maximize the results of an educational system, creators of the system must consider the many ways people learn, what are their natural gifts and weaknesses, and how one’s education can best help society cooperatively. The wise farmer plants his precious seed in the fertile prepared soil in the best way to allow for easy harvesting. Planting the same seed everywhere would be a waste. In the same way, societal changes, as Miki sites in her example, cannot be forced on all. Not without reaction. It would be like throwing the seed on to concrete--it might attract insects or mice but would not yield crops. I am not exactly sure how incorporating this concept can affect one’s efforts for bringing about positive social change, but I think it should not be ignored. I will just say one more thing about it which is that consideration of this truth can foster more realistic expectations, hence, less disappointment. Reading this, I feel compassion for Gandhi, who I'm guessing experienced a profound degree of responsibility and yearned for the most effective means of service. I come back to compassion for all, and awareness that in any given moment, we're doing what have the capacity/insight/resources to do. May we be open (and kind) to ourselves and each other as we risk our significance! In addition, I think of Joanna Macy and Molly Young Brown's work (see, for example, Coming Back to Life). They talk about how there are multiple levels of action. There is a place to take care of the people who are currently in pain -- e.g., homeless shelters (among about a million examples). This might sometimes look like accepting short-term, very imperfect solutions. Then there is a place for addressing the consciousness and structural power issues underlying homelessness. I see different aspects of NVC having applications on both levels. And I feel some hope when I imagine there are people working on both levels. I don't have a sense that any particular outcome is certain; I do trust in the POSSIBILITY of surprising moments of profound personal and global transformation. Also, in the interest of sustainability, I hope that people working on both levels will find ways to have compassion for themselves if they make "mistakes." My memory of Joanna's Macy's work is that she talks about three different aspects of the "great turning"...all of which are necessary. Different people will be drawn to working in different areas at different times. It helped me to see a place for honoring all the work that people do instead of qualifying some things as more important or urgent than others. One she calls "holding actions," such as the work of doing what it takes politically to stop the energy giants from drilling for gas and poisoning the groundwater in my home state of New York; the second is "transforming consciousness," which is all that we do to grow and develop into the most expansive human beings we can be, and the third is "creating new structures," such as creating new institutions and organizations to be a place for this consciousness to flourish. I find this road map extremely helpful. So, working for a change of heart is not a luxury. It is a necessity, along with these other two pillars of transformation. This story that you tell, Miki, illustrates to me the limits of a charismatic leader. I'm have been seeing for a while now that leadership needs to be held more in a collective sense so that many more people kind find their voice, their gifts and their place in the movement toward a thriving future. In this sense, leadership development seems of primary importance in moving forward. This also takes the pressure off of a single individual (like when millions believed Obama would be the answer) and lessens the risk of catastrophe, like when that person gets shot. We've seen that more than a few times! As always, your writing both educates and inspires thought, reflection, and movement. Dear Miki, Dominic Barter has let you know, I presume that I am both heartened that you are now more au fait with the Ambedkarite critique of Gandhi as a "false friend" of the (ex-)untouchables, and also wanting to search further with you for the elusive "truth". I told Dom that I wasn't yet ready to post on your blog about this, due to a pressing contract for doing Social Media work etc. So, I hope to come back and develop the discussion wiht you further, more on your terms than mine, next time. 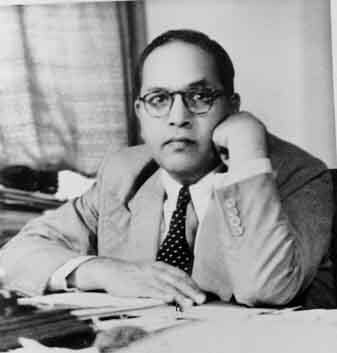 I'm interested in whether you take the most famous pamphlet of Dr Ambedkar - "The Annihilation of Caste" - as convincing enough of the lack of Gandhi's political will to end untouchability? Ambedkar's claim in this voice recording (http://youtu.be/_FNSQcEx02A) is that Gandhi chose to play v differently to different audiences; taking advantage of different languages to hide these differences. (Forgive me if my first attempt at writing this to someone of your NVC standing is full of jakals; translate away for me will you). The assertion implied by Ambedkar's (more?) incredible life is that Gandhi could probably only have made a real impact on "untouchability" by doing what Dr Ambedkar did; publically renounce Hinduism in favour of a religion that has a track record of challenging caste and not partronising the Dalits (down-trodden). Again many thanks for writing about this crucial struggle for liberation of millions from a cultural oppression under Hindhu culture that is not being taken seriously by the UN as a humans rights issue; for India repels such concerns as "this is an internal matter" rather than the equal of apartheid. 3. What do we do and how do we respond to leaders who have provided the world with gifts when some of their actions don't match up to their stated goals or values? I am not, and don't imagine becoming, a scholar on the topic of Gandhi and the Dalits. What I wrote is based on my own limites research and conversations with people in India. 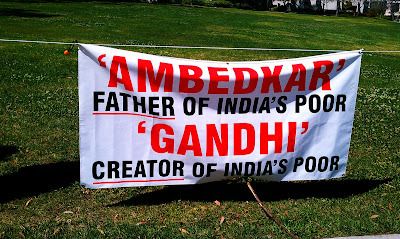 I came to the conclusion that I completely believe Gandhi about his intentions and dreams with regards to the Dalits. I think that you and many others do not trust his intention. I doubt we could come to agreements. I did read a variety of text that challenged his intention, and I listened to Ambedkar's speech that's on youtube. I nonetheless came to the conclusion I came to. I have a sense of integrity about the amount of energy I put into educating myself, and I am at peace with having reached the conclusion I have reached. As to the second point, I have a deep sense of tragedy about Gandhi's actual choices, which I believe backfired in terms of reaching what I believe were his dreams. Understanding this was the key goal I had in this piece. What I learned about the limits of the moral force of an individual is a deep lesson for me as someone working for social transformation in my own small ways. My main goal in writing this piece was to share this insight with others. As to the last point, what we do with our leaders when their actions don't add up, I plan to take up this topic in a not-so-distant future blog post.